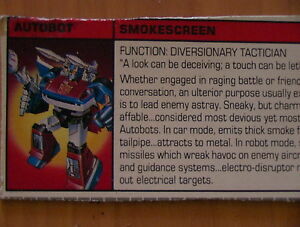 Details about Transformers G1 VINTAGE 1985 Smokescreen Hasbro Tech Specs File Card C-6 Cond!!! Transformers G1 VINTAGE 1985 Smokescreen Hasbro Tech Specs File Card C-6 Cond!! !